It's a miracle Devil May Cry 5 exists after the last game in the franchise, 2013 reboot DmC: Devil May Cry, was poorly received by fans. The Devil May Cry series of action-adventure games was one of the mainstays of the PS2 era with three entries on Sony's console, followed by 2008's slick Devil May Cry 4 for the Xbox 360 and PS3. More recently, creator Capcom's energies have been spent focussing on the likes of Resident Evil, Street Fighter, and Monster Hunter with varying degrees of success, making Devil May Cry 5's reveal at E3 2018 a pleasant surprise. 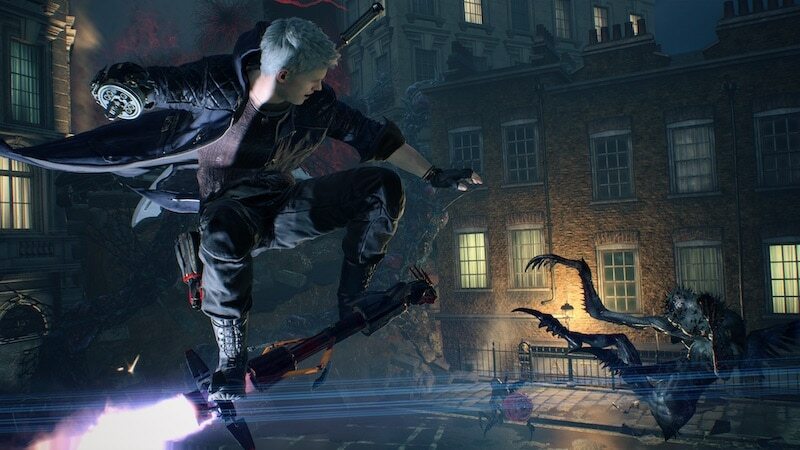 Devil May Cry 5 has you playing as Nero and Dante, returning demon hunters from past games as well as a new character named V. A spate of demon attacks across the world leads them to Red Grave City, where the Qlipoth — a gigantic monster spawning tree — has taken root thanks to a powerful demon known as Urizen. It's up to the trio to stop Urizen and his minions across the game's 20 chapters. Nero, Dante, and V control differently, each with their own unique set of weapons and abilities. Nero has a sword, a double-barrelled revolver, and a host of robotic arms known as Devil Breakers. These allow him to freeze enemies in place or stun and push them away with a jolt of electricity. Dante has an assortment of swords, gauntlets, rocket launchers, pistols, shotguns, and even a motorcycle that splits into a pair of buzzsaws called the Cavaliere. He also has four distinct fighting styles: Trickster, Royalguard, Swordmaster, and Gunslinger. Trickster allows him to dodge enemy attacks, Royalguard focusses on defence, while Swordmaster maximises the moves of melee weapons, and Gunslinger allows for greater efficiency of firearms. Both Dante and Nero deal with Devil May Cry 5's foes with a flurry of stabs, jabs, gunshots, and explosions. While the sheer variety in Dante's arsenal is great, Nero's Devil Breakers are just as welcome. They shake up moment to moment gameplay tremendously, allowing him to grab enemies from a distance or pause time to land an extra hit or two, allowing for a wider range of strategies compared to past games. This isn't all. Like past Devil May Cry games, you'll come across red orbs as you play. They let you unlock new skills such as firing bullets that stop enemy movement or the Stinger, a move that allows you to dash forward to land a piercing blow. There's always something fresh to try out provided you have enough red orbs to spare. Which brings us to a possible point of concern. 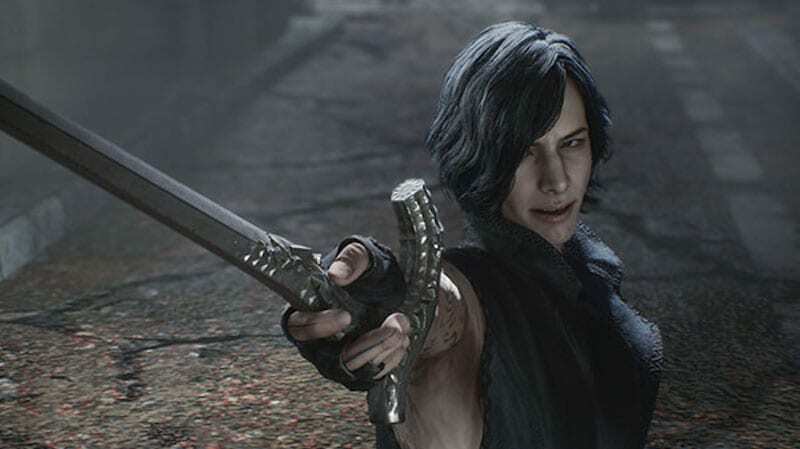 In our time with the game, we never felt the need to bother with Devil May Cry 5's micro-transactions that would allow us to buy red orbs to unlock new skills and abilities. It was easy to earn them at a steady pace by simply playing through the game normally. The concern comes from us wondering if this will still be the case after the game has been out for a while what with the likes of Call of Duty: Black Ops 4 changing and introducing new monetisation methods post-launch. The fighting system rates how you play by emphasising on attack variety, combos, and split second dodges, and parries. You'll soon realise that experimenting with the vast skillsets of Dante and Nero isn't just a novelty to show off visually stunning ways to destroy your opponents. It's rewarding as well. This is because a higher rating means even more red orbs that lets you unlock even more abilities. Both Dante and Nero are fast-paced, brutal combatants with a fantastic number of moves and their disposal that makes combat a stylish affair. They also have their own gauges which fill up as you play to allow for more powerful attacks and combos. And while playing as Nero or Dante is entertaining, V is too much of a departure. Without spoiling Devil May Cry 5's story, V can't take on demons head on like Dante and Nero can. Instead, he commands three of his pets — a leopard, a bird, and a slug-like creature known as Nightmare. They're references to enemies from past games, and here you'll use the pets to take down Devil May Cry 5's many demons. Simply tapping a button causes them to attack and sufficiently weakening an opponent allows V to swoop in to finish it off with a killing blow. It's an interesting wrinkle to the frenetic pace of play that comes with donning the role of Dante or Nero, but V's sections in Devil May Cry 5 aren't as enjoyable as the combat feels slower compared to the rest of the game. Whenever the game gave us the option to play as Dante or Nero instead, we opted for that. Thankfully, only four of the game's 20 chapters force you to play as V and they're on the shorter side. While the inclusion of V makes sense from a narrative standpoint, we wonder these would have been if Capcom had opted to make fighting as V feel more immediate and impactful rather than plodding. And speaking of narrative, Devil May Cry 5's is surprisingly uncomplicated. If you were expecting another God of War, this is not it, though that doesn't make it any less engrossing. It focusses on over the top action, cheesy one-liners, and the odd dance sequence that would give Bollywood's finest a run for their money. You won't feel lost while playing through it either. Much like the Yakuza games, there's a handy recap of the events of past titles. What's more, Devil May Cry 5 looks great. Be it demons, nightmarish landscapes or intricate animations, there's little amiss in its presentation. It uses Capcom's proprietary in-house RE Engine that powered the excellent Resident Evil 2. Coupled with a steady 60fps on Xbox One X and you have one of the better looking and responsive action games in recent memory. However this visual fidelity comes at a price. Devil May Cry 5 has a ton of loading screens. Thankfully they're not as bad as Anthem or Sniper Ghost Warrior 3, but they're hard to miss. From customising your character load out or watching one of its many cut-scenes that bookend each chapter, you'll be presented with loading screens aplenty. Gadgets 360 played a review copy of Devil May Cry 5 on Xbox One X. The Devil May Cry 5 release date is March 8 for PS4, Xbox One, and Windows PC at a price of Rs. 3,499 on console and Rs. 2,999 on PC ($60 in the US). product Devil May Cry 5 for PS4, Xbox One, and Windows PC release date is March 8, should you buy it? We tell you in our Devil May Cry 5 review.